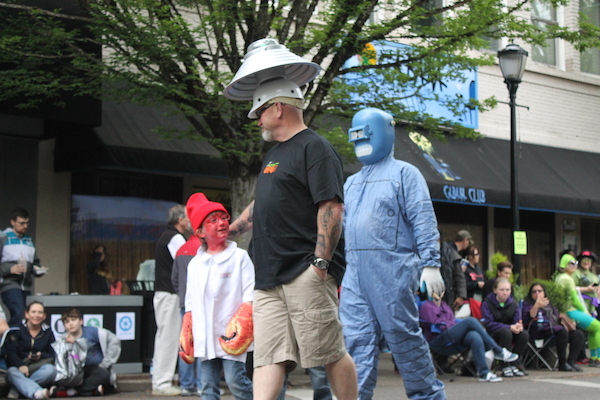 Portland, Oregon lays claim to general weirdness, but nearby McMinnville embraces quirky for a long weekend each May. Published in LIFE magazine in 1950, grainy black-and-white photos taken in at the Trent family farm in the outskirts of McMinnville are considered the earliest credible UFO photos ever captured on film. 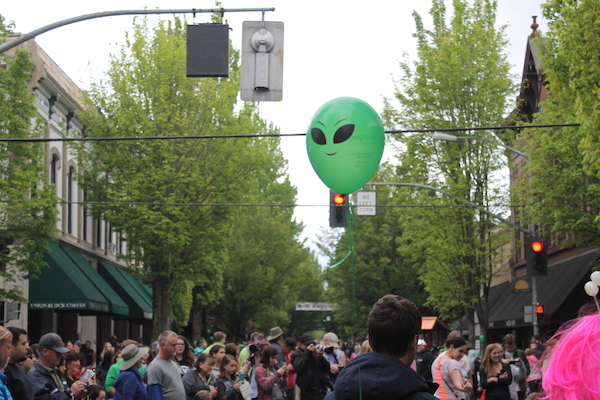 Embracing the notoriety, modern-day McMinnville have welcomed skeptics and believers to their otherwise bucolic downtown for the annual UFO Festival (now between its sixteenth and seventeenth year). 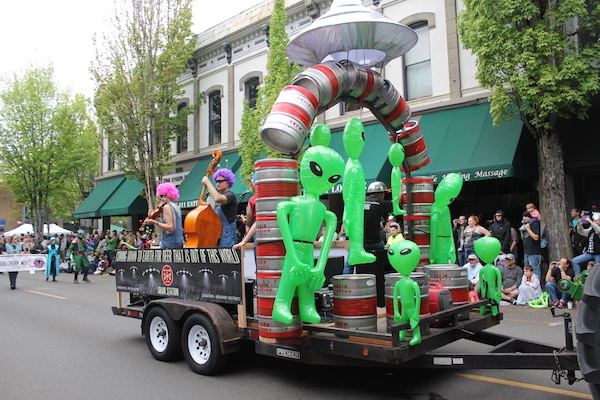 A four-day event, UFO Festival central is split between Hotel Oregon at 310 NE Evans Street and the McMinnville Community Center. 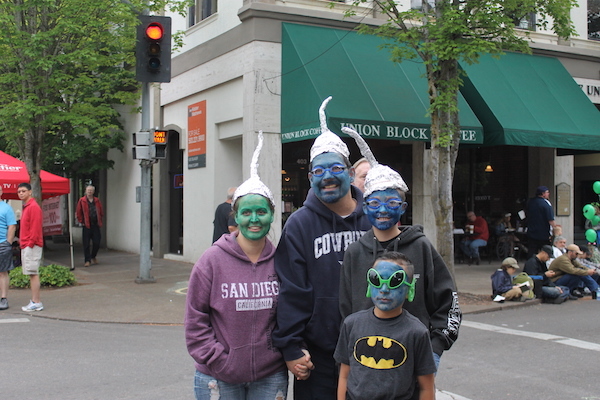 While the main draw is the family-friendly Saturday events and Alien Parade, a VIP pass to the UFO festival costs $70 and includes entrance to five speaker events. 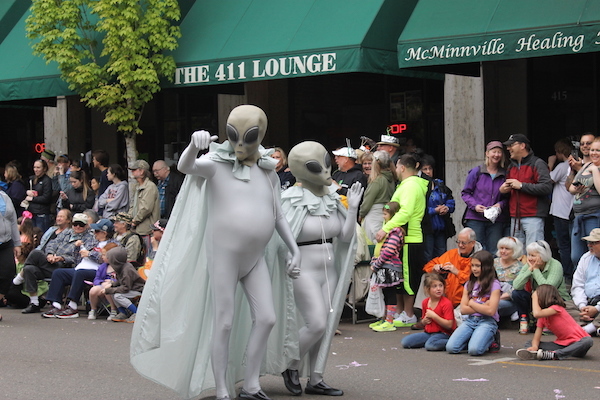 Lunch and breakfast with the speakers is an additional fee, and if you book a room at the Hotel Oregon, you’ll receive $40 in food and credit, a pair of tickets to a UFO event, and “surprise” amenities (let’s just hope there isn’t any “probing” involved). The lineup of 2015 speakers featured a nuclear physicist, abduction/ET contact researcher, ufologist, the director of the UFO Reporting Center, and Travis Walton (who was allegedly abducted by aliens for five days in 1875). Beyond the paid education component, the Downtown McMinville organization puts on a one-mile fun run ($12/person). 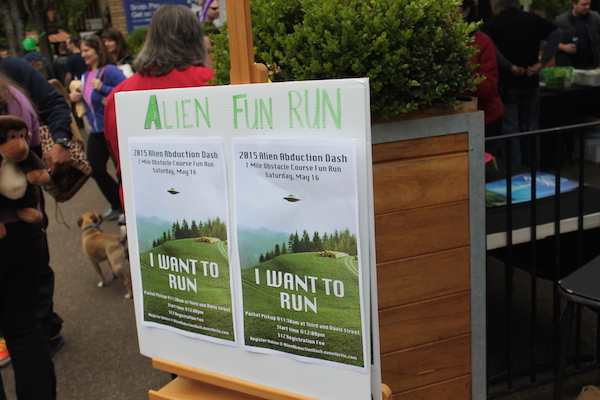 The “I WANT TO RUN” tagline for this event makes me laugh every time I see this photo. 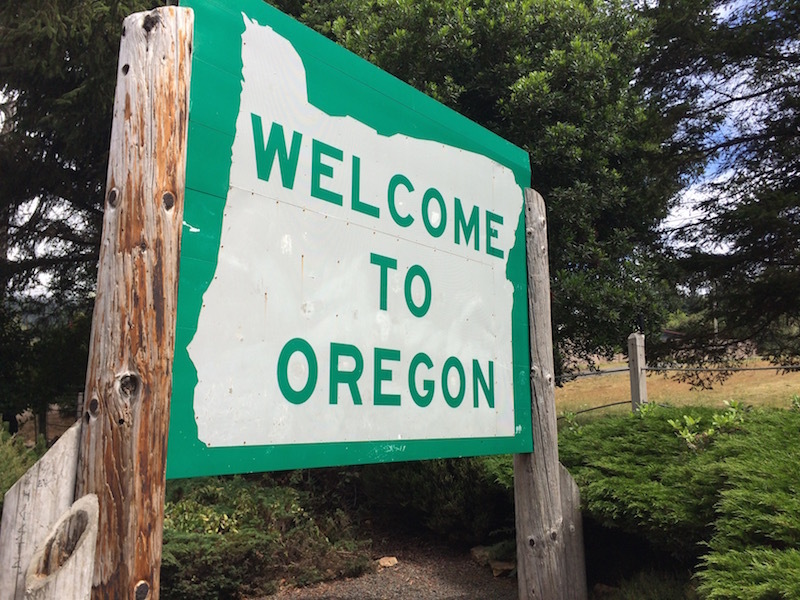 While we did not participate this year, I would register our whole family for a future event (as would Brian Bernier, who described his experience on the Run Oregon Blog). 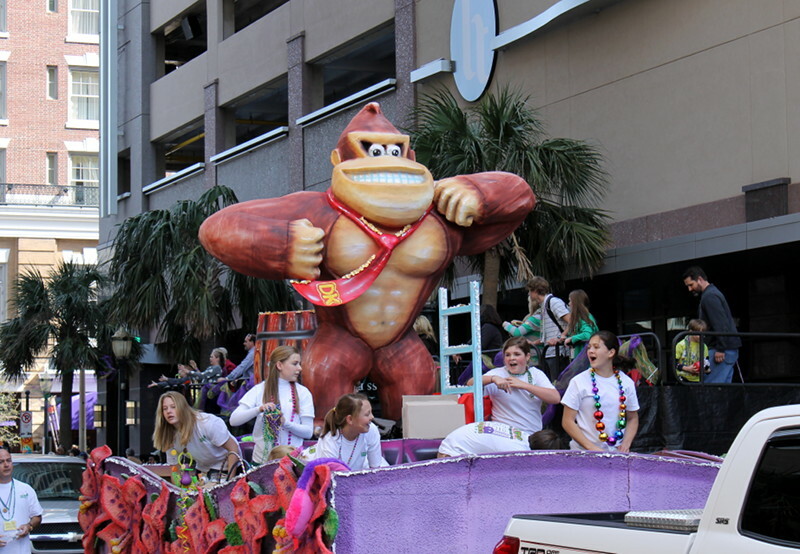 Arriving one hour before the parade, we found easy enough street parking, shuttles ran every fifteen minutes between downtown and designated drop off points. Half the pre-parade fun is wandering around and checking out the elaborate and creative costumes (kids and big kids all get in on the action). 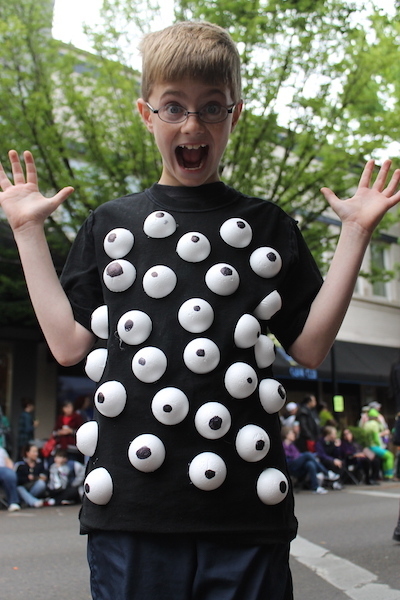 Check out the eyeball costume I made with my oldest son. 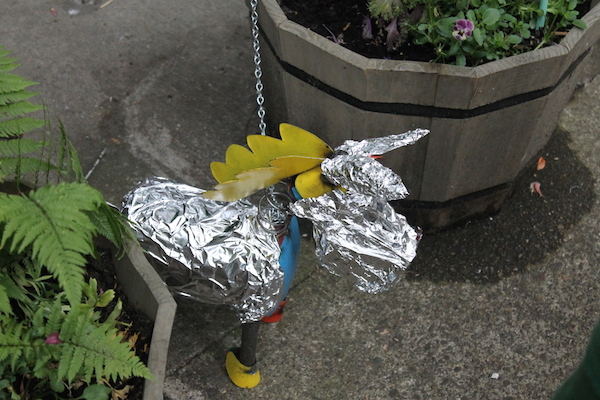 If you ever wanted to wear an aluminum foil hat, this here’s your chance! We coughed up $5 for kettle corn and I purchased a souvenir t-shirt featuring a floating green alien head screen-print above the word “Believe”. A close second was a design paying tribute to the late Leonard Nimoy with the hashtag #LLAP (Live Long and Prosper, for those of us not hip enough to figure it out). A crowd milled around local musicians playing a combo on the drums and didgeridoo and kids held tight to their free balloons. 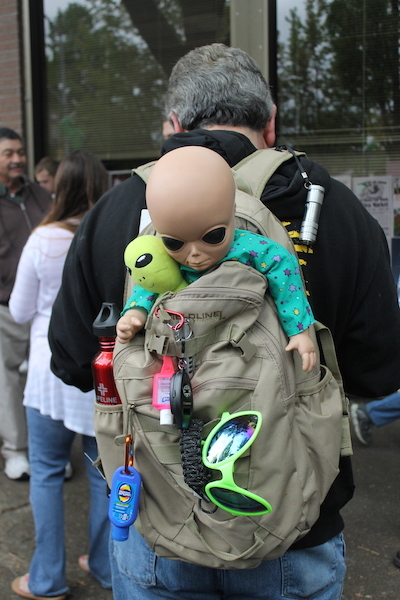 One man let me take a photo of his alien baby “Rebecca,” who seemed oddly at home in the perch of his backpack. 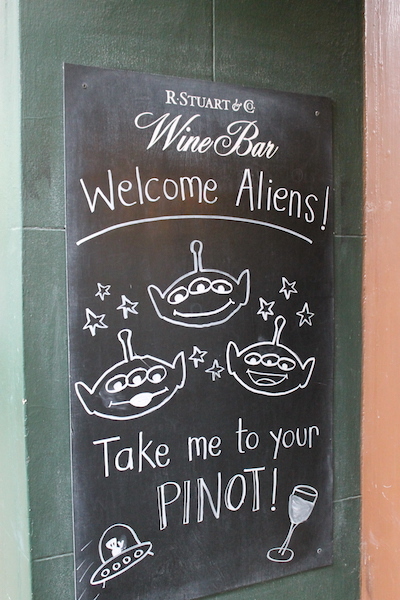 Local businesses clearly got into the spirit of things with sales and special food and drinks honed in on the extraterrestrial theme. 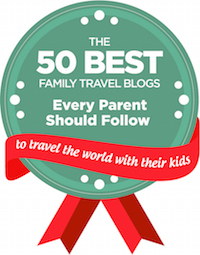 My favorite examples were the “Take me to your Pinot” sign on display wine store and the gift shop that covered its lawn ornaments in aluminum foil. 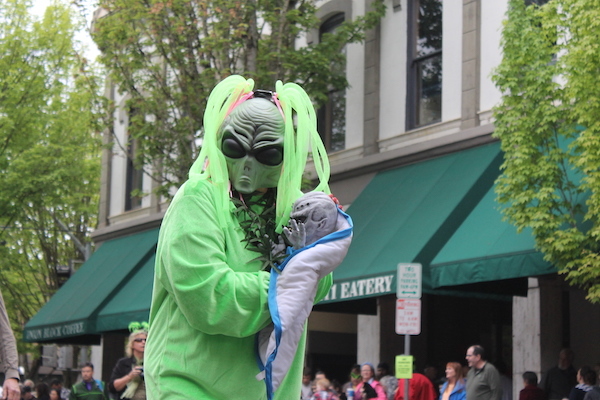 Starting at 2PM, the Alien Parade was out of this world. Curbside real estate started getting slim in the last hour leading up to the first float—people marked their territory with lawn chairs and blankets. If you have bribed your children with the promise of Dollar Store tootsie rolls, plan to sit and people watch for a bit. 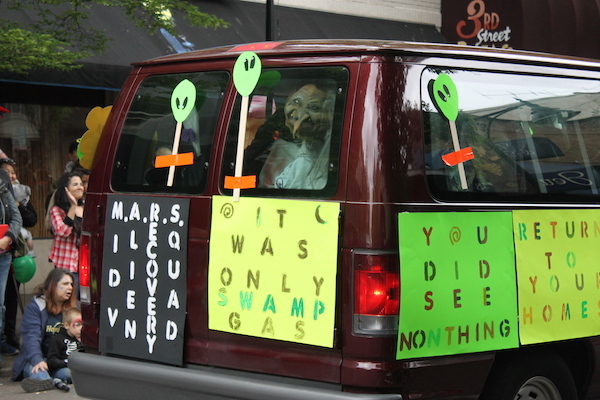 School marching bands, elected officials, realtors, and fire trucks fell in line with a creepy abduction van, remote-control saucer, a kung fu students dressed in Star Wars attire. 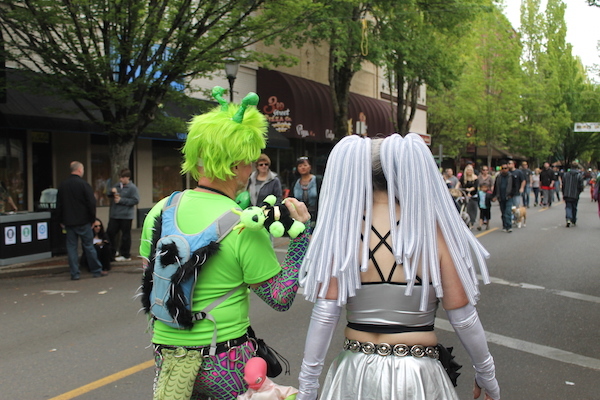 My personal favorite was the couple dressed in skintight metallic bodysuits (see main photo above).